Creating the first Example row and Input/Output column. Move the marker one cell to the right by pressing the right arrow or tab key. Now press the return key and a prompt will appear that says "Create new Input/Output column?". Answer Yes. Press return again and the Edit Grid dialog box will appear. This time the Example row will already contain a name and type. You can set the cell value, the Input/Output name and the type can be set to "I:" for input, "O:" for output, "X:" for exclude or "S:" for serial. The mode can be set to "Real", "Integer", "Bool" or "Text". 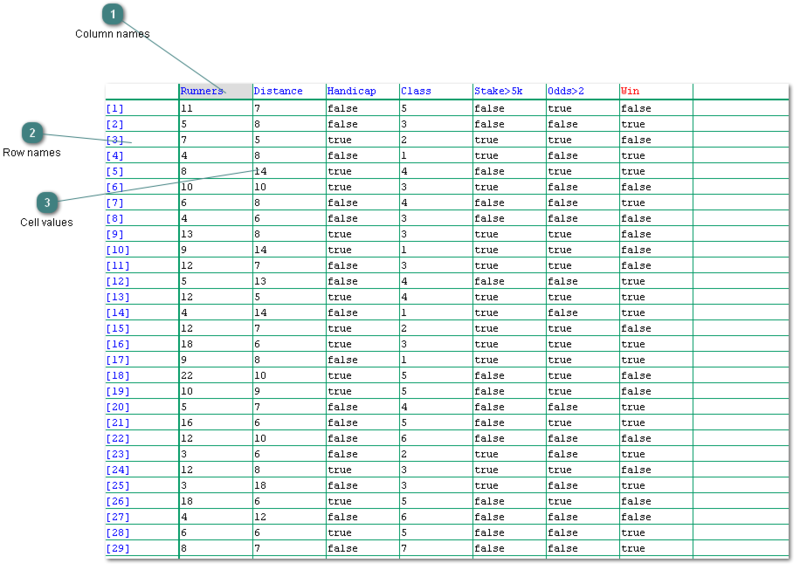 Any type of Input/Output column can be inserted into the Grid using the functions on the Insert menu. The columns can be named or numbered. The rows can be named or numbered. The grid cell values can be integer, real, boolean or text.